Recent Panorama and Dispatches episodes confirm: the media has never been so biased against a Labour leader. It was hardly a night of vintage investigative journalism in the tradition of Bob Woodward, Seymour Hersh, Nick Davies or Heather Brooke. Both the BBC’s Panorama on the impending ‘death’ of the Labour party under Jeremy Corbyn’s leadership and Channel 4’s Dispatches investigating Momentum, an organisation so shadowy that they hold huge public meetings and have the nerve to ask Labour members to vote for their preferred candidates, chose to attack Jeremy Corbyn and his supporters in the lead-up to the result of Labour’s leadership election. The programmes contained no political earthquakes and no actual evidence of inflammatory behaviour or illegal activities though there was a lot of Neil Kinnock who has suddenly become a sage with respect to Labour’s electoral fortunes. What was outrageous about the programmes was not that they weren’t formally impartial – indeed Panorama, in particular, included both supporters and opponents of Corbyn – but that their overall agendas could have come straight from a PLP meeting. ‘Is the party over?’ asked Panorama about an organisation that now has the biggest party membership in Europe. Dispatches, on the other hand, focused on a tiny handful of Trotskyists prepared to ‘battle for the Labour party’, a starting point that conveniently allowed them not to investigate the policies that have so energised the hundreds of thousands who have rallied behind Corbyn. The language in both programmes was consistently skewed: ‘moderate’ Labour MPs (ie those who have forced a hugely divisive leadership election) are tearing their hair out because of ‘entryists’ from the ‘hard left’ whose commitment to democracy is so threadbare that they are standing in freely contested elections for positions in the party and running phone banks in support of Corbyn. Given the paltry amount of high quality current affairs output on free to air TV, it’s more than a little depressing that so many resources could have been committed to programmes that achieved so little in the interests of so few. The two programmes are, however, only the latest examples of a systematic misrepresentation and distortion of the Labour leader. Corbyn, unlike Theresa May, was never allowed a honeymoon by the media. A Panorama that aired last year before his victory was so one-sided that a BBC producer actually wrote to the Corporation’s in-house magazine Ariel to complain that it was ‘seen by many as a character assassination of just one of the four candidates’. (So pluralistic is the British TV landscape that the same indie producer, Films of Record, made both that programme as well as this week’s Dispatches.) In the week following Corbyn’s election, the Media Reform Coalition found that some 60% of articles in the press were overtly negative with 27% neutral and only 13% positive. 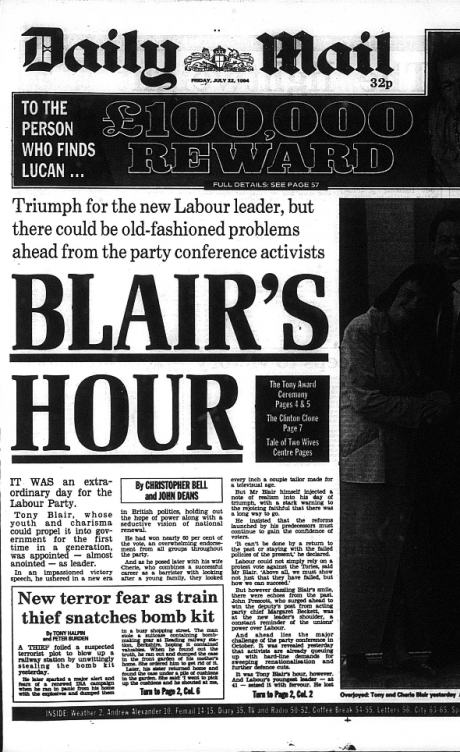 Daily Mail front page from Blair's election as Labour leader. One reaction to this systematically negative coverage has been to claim that all Labour leaders have faced the same levels of hostility from the media. This simply isn’t the case. It’s true that Neil Kinnock and Ed Miliband were mocked and/or vilified at different points in their leadership but not so much when they were first elected. Indeed, George Lansbury – the Labour leader who is perhaps the closest politically to Corbyn and who resigned as leader in 1935 because his pacifist principles weren’t compatible with the rest of the Labour leadership – was virtually ignored by the right-wing press of the day. Other Labour leaders from both the left and the right of the party faced nothing like the hostility that Corbyn can expect each morning. 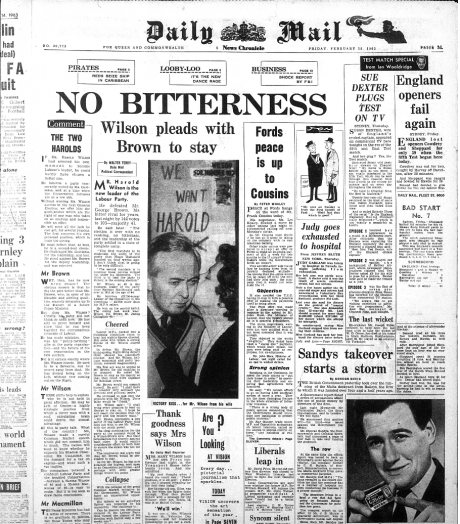 Take this, for example, from the front page editorial of the Daily Mail when Harold Wilson was elected leader in 1963: ‘Without wishing Mr Wilson success in the next general election, we offer him the good wishes which are the right of any man who takes on so onerous and responsible an office.’ Not exactly the spirit that informs coverage today. 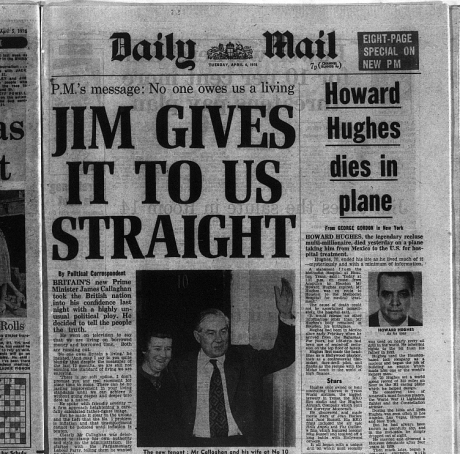 The elections of both James Callaghan and, of course, Tony Blair were also covered in pretty glowing terms by much of the press because both were publicly committed to pursuing agendas (notably taking on the left of the party) that were acceptable to the press. The Mail described Callaghan as a ‘man who decided to tell the people the truth’ in its lead story following his election while Blair received gushing front pages in 1994 with the Mail speaking of his ‘youth and charisma’ that could ‘propel [Labour] into government for the first time in a generation’. The key difference is that Jeremy Corbyn represents – and, crucially, is seen to represent – a potential threat to vested interests in a way that right-wing Labour figures never did. This is what underlies the extraordinary hostility to his leadership. Any radical individual or movement that refuses to abide by the usual consensus on austerity, immigration or foreign policy can expect to be either marginalised or ridiculed, misrepresented or ignored. 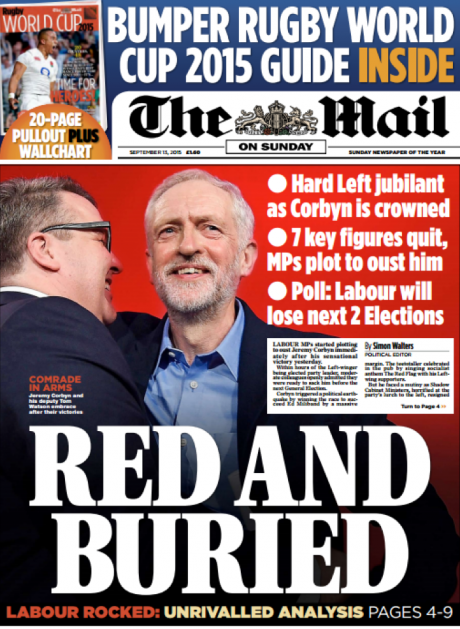 Daily Mail front page from Corbyn's election as Labour leader. This tells us a lot about the balance of power in the mainstream media: you depart from the rules, you should expect to be punished. Should Corbyn win the leadership election, we can expect more attacks, more dirty tricks and more misrepresentation. But the best response to this is not to bow down before media power, it’s to intensify your campaigning and sharpen your opposition. That’s the lesson of history: trade union rights weren’t won by Chartists with a clever media strategy; the suffragettes did not, as far as I know, stop smashing windows because it didn’t play well in middle England; today, I suspect that junior doctors will be best able to defend the NHS not simply by making reasonable arguments on news bulletins (which they often do brilliantly when given the opportunity) but by organising the action that makes it difficult for journalists to ignore their demands and mock their arguments. Progressive movements and parties have to make effective use of social media and engage with mainstream media at the same time as challenging their agenda-setting power. But they don’t need an army of spin doctors and communications consultants to do this. Instead they need to use all available channels and spaces to inspire and mobilise ordinary people who are desperate for a genuine alternative to inequality, warmongering and profiteering. This is, after all, the exact same public, a majority of whom, according to YouGov, also believe that the mainstream media has been deliberately biased against Corbyn. 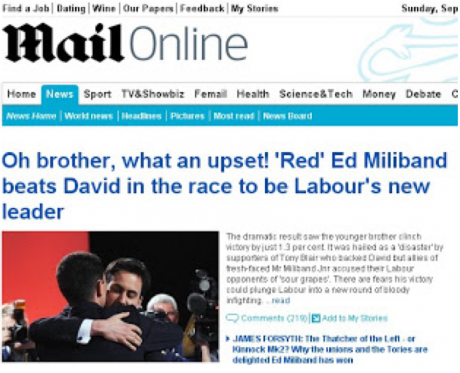 The lazy and partisan attacks by Dispatches and Panorama will simply add to that perception.